There was plenty to change in our chart and guide to the best guitar tuners around, including the replacement of some models. We trimmed things down but added a few new tuners, such as the excellent budget DT-1 pedal from Donner, as well as a higher-end clip-on Korg PitchHawk G2 and the beautifully-displayed KLIQ UberTuner. As we have mentioned so many times on this site, when buying your first guitar, the buying process doesn’t end with the instrument. Aside from the obvious amplifier and cable required for electric guitar, there are some other accessories that are simply a must-have for any guitarist. One of them is a tuner. Gone are the days of having to tune up to a piano or with a pitch pipe – sophisticated digital tuners now exist to make a guitarist’s life very easy indeed. So, whether you are an electric or acoustic guitarist, a bassist or even a ukulelist, check out the chart below highlighting some of the best tuners around, before reading our guide to what to look out for when buying a tuner. 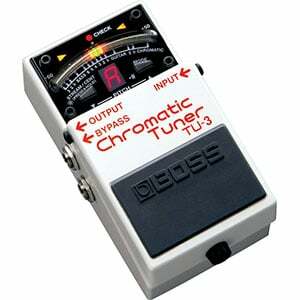 A professional-grade stompbox tuner from Boss. A solid pedal tuner that rivals anything on the market. A surprisingly good pedal tuner for an affordable price! An accurate handheld tuner packed full of features. A popular and affordable handheld tuner from Korg. This high-quality device sets the bar high for clip-on tuners. A beautiful screen and a wide tuning range for a small price. A tiny price tag for a clip-on tuner offering huge value. While it’s not cheap, this excellent TU3 Tuner Pedal from pedal masters Boss is the only tuner for serious musicians. This quality stompbox-style pedal fits nicely onto any pedalboard, offering a very robust casing that houses a professional-grade tuner with a wide tuning range of C0 to C8. Among other things it features a 21-segment LED meter with a high-brightness mode (perfect for playing outdoors in bright conditions); both chromatic and guitar/bass modes (including 7-string guitars and 6-string basses); and a Guitar Flat mode for low tunings. Highly recommended for gigging musicians. Working out around the same price as the Boss TU3 above, this pedal tuner from TC Electronic is an attractive addition to any guitarist’s rig. With a durable white stompbox-style case, the PolyTune 3 features accurate (to +/- 0.1 cent) polyphonic, chromatic and strobe tuning modes, allowing gigging musicians to mute their sound and quickly tune up on stage, while buffer circuitry ensures you don’t lose tone when adding this pedal to your lineup. The display screen is very easy to read, although doesn’t perform as well as the TU3 in bright sunlight. Looking for a tuner pedal on a budget? You don’t have to look further than the DT-1 from Donner, which comes in at under twenty bucks! Providing you can get past the name, this sturdy aluminum-alloy-cased pedal is a solid little addition and does the job required. The LED indicators and small LCD display offers clear readings of the chromatic tuning (A0 to C8), which is suitable for guitars and bass with +/- 1 cent accuracy. It also features a true bypass, so doesn’t affect your tone when plugged into a chain. Exceptional value. This 3-in-1 tuner is a very popular device from KLIQ, offering a very accurate tuner, metronome and a tone generator in a single handheld package. The sleek MetroPitch caters for basically any instrument, with a tuning range of A0 to C8 and a calibration range of 410 to 450 Hz. It’s easy to use, with a clear LCD screen and intuitive design. The metronome is a bonus, offering a loud and clear tone with varying speeds ranging from 30 to 250 BPM. Comes with a built-in kickstand and a carrying pouch. The GA1 from Korg is an incredibly popular handheld tuner, offering both solid performance and great value. While it’s not swimming in features, the GA1 does things well. Housed in a robust black plastic case, this compact tuner is very versatile, covering both guitar and bass, including 5-string bass and 7-string guitar frequencies, and a Quinta Flat Tuning mode, which supports lower tunings – perfect for modern metal. This is all displayed on a simple LCD screen with a high-precision needle-type meter. The battery life is a pretty great too – a bonus for under $15. While you can find some very affordable clip-ons, the PitchHawk G2 from Korg sets the bar high for this style of tuner. Even though the price is a little higher, this professional tuner features a slim body with a colored LCD screen which proves easy to read. There are both dedicated guitar and bass modes, as well as modes for flat and capo tunings. All modes offer the precision you would expect from Korg (+/-1 cent). A couple of other features, including a ‘first string over-winding indicator’ set this clip-on in a tier above. Another solid offering from KLIQ comes in the shape of the clip-on UberTuner. This compact device happily clips onto any headstock and offers a very vibrant and attractive full-color backlit LED screen with intuitive display settings. It’s suitable for most instruments with a wide tuning range of A0 to C8, and a variable A4 frequency of 430 to 450 Hz. It’s a very flexible tuner with 360-degree turn and 125-degree tilt, so it can be clipped anywhere and moved around to face you. The battery life is also very good, offering great value. While Snark offers more feature-loaded clip-on models, it’s hard to beat their SN5X when it comes to value. This compact clip-on tuner offers top-notch efficiency and accuracy for a wallet-friendly price. Clipping onto to the instrument via padded jaws, the 360-degree swivel head offers a quality little screen showing a very bright and attractive display that can be viewed from all angles. Suitable for both guitar and bass, the SN5X also features a built-in tap tempo metronome. For under ten bucks, this is a very smart purchase for any guitarist. Most guitarists will be familiar with a pitch pipe, but tuners have moved on since ‘by ear’ was the best way to tune a guitar (although training your ear to recognize notes is still a very good thing to do!). Let’s check out the three main categories of digital tuner and what they bring to the table. As the name suggests, these tuners clip onto your instrument, usually the headstock. While some clip-ons have microphones, most will determine the guitar’s pitch by measuring vibrations picked up through the clip – which means no external noise will affect the reading. Clip-ons have a small but very readable LCD screen, many offering the readout in full color. Clip-on tuners are considered highly practical and convenient as they are always attached to the headstock and don’t require you to rest the device on your lap or a table while in use. They tend to be the most affordable too, although also tend to be the least accurate and feature-packed. You guessed it – these tuners you hold in your hand or rest on a table! These tuners are usually very accurate, inexpensive, durable and easy to use, as well as small enough to slip into a gig bag. These smartphone-sized tuners offer an LCD display, which is often bigger and more detailed than a clip-on tuner. They often use a needle (either physical or LCD representation) to display the reading and have many different tuning settings – sometimes with metronomes and other features built in. The battery life tends to be very good too. The main disadvantage to these tuners is that to use them, you need to have a hand free to hold it or – more often than not – balance it awkwardly on one knee. Pedal tuners take the form of a classic stompbox and will sit alongside the other pedals on your board. These tuners are designed to be used on stage and using one is as simple as pressing a switch with your foot. Pedal tuners have plenty of features, although their main draw is that they are convenient, have bright displays and tend to be the most accurate option. However, they also tend to be the most expensive option too, ranging from around $40 to $100. They are also bulkier than other tuners, making them less convenient to carry around. For a beginner, a pedal tuner is usually overkill, but these are great options for gigging guitarists. You don’t want to fork out for a clip-on, handheld or pedal tuner? Or want a backup incase you lose, damage or let the batteries run out on your dedicated tuner? Other tuning methods do exist! However, be warned that they aren’t quite as convenient or accurate as a dedicated tuner. Firstly – as we’ve mentioned earlier – one of the more traditional methods is to use a pitch pipe. These devices (where blowing into a little pipe will deliver the pitch you need) can be picked up for a few dollars but are not as accurate or reliable as digital tuners. If you still want digital, but don’t care for having a dedicated tuner, you can use online tuning apps or iOS or Android apps for your smartphone/tablet. Most of these are free, although some are a few dollars and offer more advanced features. Apps such as Pano Tuner, gStrings, Martin Tuner, and Pitchlab are worth checking out if you are going down this route. The good news is that most tuners – especially the most popular – work very well with a high degree of accuracy (usually around +/- 1 cent) that will suit both beginners and experienced guitarists. So what you look for will depend more on what you want out of your tuner. If you are a complete beginner, a clip-on tuner will usually be your best option. You may find yourself tuning up quite often (especially if the guitar and/or strings are new), so having the tuner constantly clipped to the headstock is very convenient. More experienced guitarists will also benefit from a clip-on, although may want to explore the advanced features offered by handheld tuners. Or the stage-ready convenience of a pedal tuner. How much you spend will depend on your budget. As you will have seen in our chart, a great tuner can be picked up for under $15, so you don’t need to spend much more than that to find something that will last you a long time. Regardless of what style you go for and how much you spend, look for a tuner with a clear screen that works well in bright conditions (especially if you play outdoors). This screen displays the readout that will tell you the current pitch of the string and whether to loosen or tighten it. So clarity is essential, while color is an advantage. Battery life is also important as you don’t want the tuner to die just before you head on stage. Most will have a great battery life (upwards of 100 hours) but will also offer a low-battery indicator to let you know when it’s time to pop in a new battery. However, it’s also worth having a backup tuner, such as a smartphone tuner app, just in case. There we have it – a selection of some of the best tuners on the market at the moment, as well as a short guide on how to find one that suits you. Hopefully you will have found some inspiration ahead of making a purchase, although providing you go for a popular model with good ratings and reviews, it’s actually quite hard to go wrong. Good luck!